Software-defined networking (SDN) and Network Functions Virtualization (NFV) are disrupting the market for networking equipment. NFV is enabling carriers to transition from traditional purpose-built equipment to servers and switch/router platforms designed for data centers. The combination of server virtualization and SDN has pushed the network edge into the server in the form of a virtual switch. Open-source projects, such as Open vSwitch, ONOS, OpenDaylight, and OpenStack are creating an ecosystem around SDN/NFV. Against this backdrop, the market for network processors (NPUs) has declined while the intelligent NIC (iNIC) segment has emerged. In both categories, however, in-house ASIC designs developed by OEMs or cloud-service providers have hindered the merchant-silicon market. Entering 2017, vendors are adjusting their strategies to navigate this changing landscape. Acquisitions continue to alter the competitive dynamics, with several vendors now offering customers multiple architectural approaches. The newest NPUs have scaled to 400Gbps and beyond to support high-density line cards and 100G Ethernet. Some remain focused on Layer 2/3 forwarding, whereas others are addressing flow processing at Layers 4 through 7. These NPUs address smart top-of-rack switches and appliances in addition to line cards. Intelligent NICs (or smart NICs) are addressing Open vSwitch offload in high-volume server designs, moving from 10G Ethernet to 25G Ethernet. High-end iNICs address early demand for 100G Ethernet in SDN and network-security applications. This report covers programmable NPUs including Broadcom’s StrataDNX line and Mellanox’s NPS line. It covers iNICs from Cavium, Kalray, Mellanox, and Netronome. Only The Linley Group has the technical depth to give you the complete picture. How do the latest products stack up? What is the market outlook for merchant products? 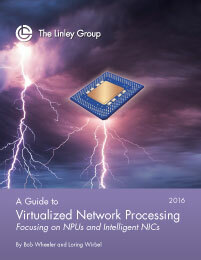 "A Guide to Virtualized-Network Processing" is the result more than a decade of research that cannot be duplicated. If you are interested in following this strategic segment, you have located the definitive source. This report cuts through the vendor hype and gives you the solid information you need to understand this market. It analyzes each vendor and each product, probes their strengths and weaknesses, then presents key details in a consistent, easy to compare fashion. For those less familiar with this technology, the report includes introductory chapters that explain important technologies. The Linley Group is the most recognized and respected name for technology and market analysis of networking silicon. Don't be fooled by weak overviews written by market analysts who really don't understand technology. The "Guide" provides a unique combination of business and technology savvy from the leading analysts in this market. Bob Wheeler and Loring Wirbel use their long experience in the networking world to analyze these devices. Together, the two authors ignore the fiction and provide the real story on each vendor and its products. Don't miss the latest information on this important market. Order now. 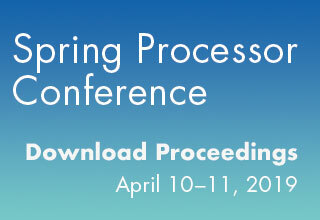 Updates to the 17th Edition of "A Guide to Virtualized-Network Processing"
Previously "A Guide to Network Processors," this report has been extensively updated to include the latest vendor disclosures as well as 2016 market data. 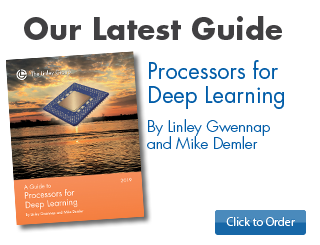 Previously A Guide to Network Processors, this edition represents a major revamp, reflecting the changing networking landscape in the era of software-defined networking (SDN) and network functions virtualization (NFV). As the network edge moves into servers, we now cover intelligent NICs (or smart NICs) that accelerate Open vSwitch (OVS) as well as other functions and protocols. In addition, we have refocused our NPU cover-age on the 400Gbps-and-faster chips that are relevant for new designs. The markets for both data-center and carrier networking equipment are experiencing a major upheaval driven by SDN/NFV adoption as well as the ongoing rise of large public-cloud operators. These changes have upset the merchant packet-processing market, which is now served by multiple architectures including NPUs and intelligent NICs (iNICs). Even as incumbent network-equipment vendors face an uncertain growth path, they continue to develop internal ASICs, limiting the merchant market. The largest public-cloud operators are also developing their own ASIC- and FPGA-based designs, leaving iNIC vendors to serve the next tier of data centers. Although the network-processor market as a whole has been declining since 2011, the top-line view fails to tell the whole story. Revenue from high-end NPUs grew from 2012 through 2015 before falling slightly in 2016. By contrast, access-NPU sales have been in continuous decline. After peaking at $397 million in 2010, we estimate merchant-NPU revenue fell to $306 million in 2016, a level not seen since 2008. We began sizing the iNIC market with the 2013 calendar year, for which time we estimate sales were only $49 million. From that small base, revenue then jumped 79% in 2014 to $87 million. The iNIC market exceeded $100 million for the first time in 2015. Although we capture all iNICs in a single category regardless of port speed, 10GbE dominated iNIC port shipments through 2016. Mellanox acquired the leading supplier of high-end merchant NPUs, EZchip, in February 2016. The company is shipping multiple product generations that combine a customer-programmable packet processor, traffic manager, and Ethernet MACs. It works with Marvell to supply special versions of its NP line to Cisco, which primarily uses them in the ASR 9000 router. Mellanox is sampling a new 400Gbps NPU, called the NPS-400, that handles Layer 4–7 features and offers easier programming than traditional NPUs. It’s also developing a new SoC for iNICs, dubbed BlueField, that combines technology from Mellanox and Tilera, a company that EZchip acquired in 2014. Broadcom is shipping NPUs in two product lines, which have their origins in two different acquisitions. For new designs, however, the company focuses on its StrataDNX family. The currently shipping version is Jericho (BCM88670), which delivers an industry-leading 720Gbps of throughput. 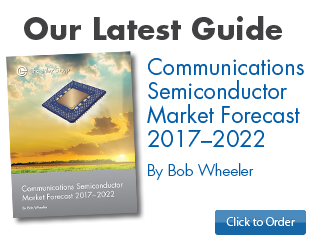 Although the BCM88670 is internally programmable, the company sells it as a configurable device using factory-supplied microcode. The StrataDNX family also includes a complete switch fabric that works with Broadcom’s NPUs. In 2016, the company added both higher-end and lower-performance members to the StrataDNX family. Thanks to its broad offering, Broadcom provides system solutions that are more complete than any competitor’s. Privately held Netronome is the leading supplier of intelligent NICs, which are based on its custom network flow processors. The company shipped its 40Gbps NFP-3240 and associated iNICs in 2011, followed in 2015 by the NFP-6000 and new cards that scale throughput to 200Gbps. After initially targeting network-security and other appliance designs, Netronome in 2016 launched lower-power iNICs for high-volume servers. Its Agilio adapters include software to transparently accelerate OVS. Cavium was first to market with low-power (25W) iNICs for cloud servers. Introduced in 2013, its initial LiquidIO adapters used the company’s Octeon II embedded processors. In 2016, Cavium began shipping LiquidIO II cards, which employ 28nm Octeon III chips. Because they give customers a standard programming environment, these iNICs offer easy software porting and customization. In addition to OVS, LiquidIO II accelerates the IPSec network-encryption protocol. 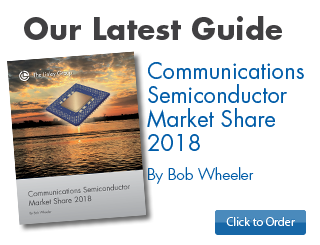 Other iNIC vendors include Kalray, which uses its own massively parallel processors, and Silicom, which builds iNICs around silicon from Broadcom and Intel. Looking forward, public-cloud data centers represent the largest volume opportunity for iNICs, but hyperscale operators are also the most likely to adopt internal designs. Amazon paid a reported $350 million for Annapurna Labs, although it has also applied the acquired technology to products other than iNICs. Microsoft developed its Azure SmartNIC, combining an off-the-shelf Ethernet controller and an FPGA as an alternate means of delivering programmability. We estimate that public-cloud data centers will consume 8.1 million 10GbE-and-above NIC ports in 2017 and that this number will surpass 10 million by 2019. Programmable iNICs will face competition, however, from partial-offload NICs as well as operators’ in-house designs. Figure 1‑1. Microsoft Open CloudServer. Figure 1‑2. Control and data planes. Figure 2‑1. P4 abstract forwarding model. Figure 2‑2. PCI Express system topology. Figure 2‑3. Simplified diagram of the Linux network stack. Figure 3‑1. Block diagram of a typical NPU. Figure 3‑2. Block diagram of a typical iNIC. Figure 4‑1. Preliminary market share of merchant NPUs by revenue, 2016. Figure 4‑2. 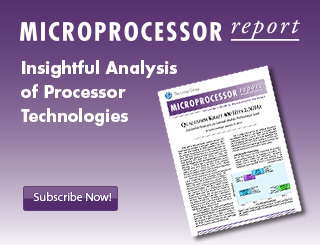 Merchant-NPU market forecast, 2015–2020. Figure 4‑3. Preliminary market share of merchant iNICs by revenue, 2016. Figure 5‑1. Block diagram of Broadcom BCM88670. Figure 5‑2. Block diagram of a Broadcom-based 600Gbps line card. Figure 7‑1. Block diagram of Mellanox NPS network processing cluster (NPC). Figure 7‑2. Block diagram of Mellanox NPS 400. Figure 7‑3. Programmable top-of-rack switch using Mellanox NPS-400. Figure 8‑1. Block diagram of Netronome Agilio CX 2x40GbE iNIC. Figure 8‑2. Netronome Agilio Open vSwitch offload architecture. Figure 9-1. Block diagram of a Kalray Bostan compute cluster. Table 2‑1. PCI Express revisions and characteristics. Table 4‑1. Worldwide revenue of merchant NPUs by vendor, 2015–2016. Table 4‑2. Worldwide revenue of merchant intelligent NICs by vendor, 2015–2016. Table 5‑1. Key parameters for Broadcom NPU and traffic-manager chips. Table 6‑1. Key parameters for Cavium LiquidIO II iNICs. Table 6‑2. Key parameters for Cavium Octeon III CN73xx processors. Table 7‑1. Key parameters for Mellanox NPUs. Table 7‑2. Key parameters for Mellanox Tile-Gx and BlueField SoCs. Table 8‑1. Key parameters for Netronome Agilio LX and Agilio CX. Table 8‑2. Key parameters for Netronome NFP-4000 and NFP-6000. Table 9‑1. Key parameters for Kalray Konic iNICs. Table 10‑1. Comparison of 400Gbps-and-above NPUs. Table 10‑2. Comparison of 25GbE intelligent NICs.